Ahhh, thank you. The words of the truth of our faith. Simple and to the point. Truth trumps everything! Do you understand the 4th Cup? After the beginning of Jesus' Last Passover Supper (Seder) Judas Iscariot left to do what he had to do. The twelve left in the room were at the point where the second of four traditional cups was about to be drunk. (The first is at the beginning of the Seder meal.) 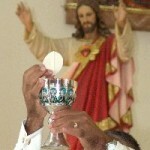 Jesus took the cup and gave thanks and gave it to them and said, "Take this and divide it among you. For I tell you I will not drink of the fruit of the vine until the Kingdom of God comes." After the supper He took the third cup saying, "Drink from it, all of you. This IS my blood of the NEW and everlasting covenant which is poured out for many for the forgiveness of sins." A hymn was sung, which is a combination of several psalms called The Great Hillel, and they went out to the Mount of Olives. What happened? The Passover ceremony and ritual was not complete. There was no fourth cup. There was no announcement that it was finished. Could it be that Jesus was so upset with what He knew was about to happen that He forgot? Doubtful! Not only Jesus, but also the 11 others had participated in the Passover Seder every year of their lives. No, this was done on purpose. The last supper of Jesus was not over. On the Mount of Olives, in the Garden of Gethsemane, the disciples slept while Jesus prayed, "Father, if you are willing, take this cup from me; yet not my will but yours be done." He prayed that three times. Then Jesus was arrested, illegally put on trial by the Sanhedrin, then by Pontius Pilate, sentenced and crucified. While on the cross He wept. Jesus, who was in excruciating agony, was so merciful that He prayed for the forgiveness of His executioners. He was offered some wine with a pain killer, myrrh, in it. He refused it. "Later, knowing that all was now complete, and so that the Scripture would be fulfilled and the kingdom established, Jesus said, 'I am thirsty.'" A man dipped a sponge into sour wine; he placed it on a hyssop branch and lifted it up to Jesus lips. It was then that Jesus said, "It is finished." He then bowed His head and gave up the spirit to His Father. The fourth cup now represented the lamb’s blood of the first Passover, a saving signal to the angel of death. The Lamb of God was now sacrificed. 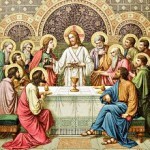 The last Passover supper of Jesus Christ was now complete with the fourth cup. It was finished. The tie in with the Passover is unmistakable. The Lamb of God was sacrifice and death was about to be passed over come Easter day. The promise of eternal life for many was about to be fulfilled. Thanks Michael for the great comments. 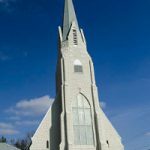 The fourth cup is indeed an important part of the story, but alas I hoped to tell just the basics – focusing on the Real Presence of Christ in the Eucharist. There is a good bit eliminated from the timeline. I noticed that your blog has a lot of great coverage of this! I hope readers of these comments go there to learn more.